Nani turns producer for the second time after D For Dopidi. He is bankrolling a movie directed by debutant Prasanth. Nani revealed that around 80% of film's shoot had been wrapped and it is planned for a February 2018 release. The 'Eega' actor added that the first look along with the title of this unique project would be revealed today (November 25), evening. 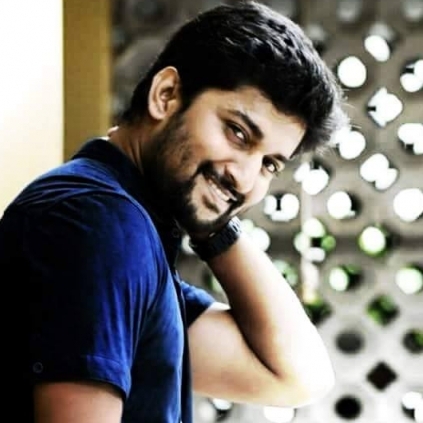 Nani is quite confident that Prasanth’s film will offer a never before experience to Telugu movie lovers. Nani has co-produced the movie with Prasanthi under Wall Poster Cinema banner. OFFICIAL TEASER SAI PALLAVI'S NEXT FILM, MCA! Here is the official teaser of Nani - Sai Pallavi starrer MCA, Middle Class Abbayi, directed by Sriram Venu and produced by Dil Raju. Neethane En Ponvasantham A Big Question Mark ? People looking for online information on Nani will find this news story useful.